Jesse Liberty, Dan Hurwitz, Brian MacDonald, "Learning ASP.NET 3.5, 2nd Edition"
With this book, you will learn how to create engaging and interactive web applications using the latest version of the world's most popular web development platform: ASP.NET with AJAX, built on the productivity-enhancing features of Visual Studio 2008. All you need to get started is a basic knowledge of HTML and a desire to produce professional quality websites. Learning ASP.NET 3.5 introduces new skills in each new chapter and offers fully annotated and fully functional examples that you can put to work immediately. Each chapter adds detailed summaries, practice questions to ensure comprehension, and exercises so you can apply what you've learned to new situations. 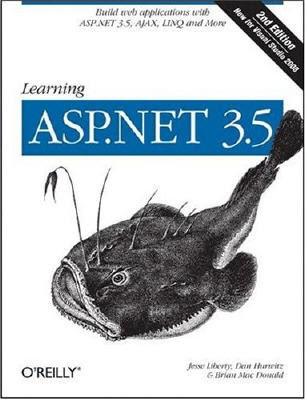 Written by the bestselling author team of Jesse Liberty, Dan Hurwitz, and Brian MacDonald, Learning ASP.NET 3.5 offers complete, up-to-date coverage of ASP.NET 3.5 and AJAX.